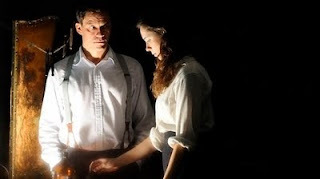 Dominic West (Robert) and Rebecca Hall (Florence) star in THE AWAKENING. THE AWAKENING is an intelligent, adult horror movie that sees Florence (Rebecca Hall), a notorious debunker of spiritualism, invited to a boy's boarding school by Robert (Dominic West) to investigate an apparent haunting. This sets up a classic haunted house movie, in the manner of Alejandro Amenábar's The Others - but with the refreshing site of a clever, independent woman as the protagonist, and the pervasive air of post-war mourning hanging heavy over proceedings. The resolution is satisfyingly complicated and there were enough genuinely unexpected scary moments to make this good horror - particularly the pivotal bathroom scene. Admittedly, there is nothing particularly innovative in the set up (Nick Murphy and Stephen Volk), but first time feature director Murphy creates and sustains a genuinely tense and morbid atmosphere that completely sucked me in, largely thanks to superb cinematography from DP Eduard Grau (A SINGLE MAN, BURIED) and a desaturated colour palette. THE AWAKENING played Toronto and London 2011. It opens in the UK and Ireland on 11th November.